Home » All Forums » [Other EVGA Products] » EVGA Software » VF Curve Tuner v0.3.13.1 not functioning. Hot!VF Curve Tuner v0.3.13.1 not functioning. Tryed reinstalling PX1 a few times, no luck. well i see there is a version v.3.14 now but still the same thing. Ryzen 7 2700X ,Fractal Celsius S36 AIO, Crosshair VII Hero, 16GB Ram 3200mhz CL14, EVGA Supernova 1600W P2, EVGA RTX 2080 ti FTW3 Ultra Hybrid with Noctua NF A12-25 in Push/Pull Configuration. Have you run scan or test yet to see if anything changes after running the scan? I have an I runs and gives me a score of +106, I applied it and it seems to work, but I just can't see the curve, it is just a small cluster of green dots in the upper Right Hand corner of the graph. i have ran both test and they give me a score, but nothing on the graph, just 1 dot top left off scree near 2500 MHz. Got it. That was the information I was looking for. Hey guys, I was curious, what resolution you are running on the monitors, as well as what your Windows resolution scale is set to. You can check this by "Right Clicking Desktop>Display Settings>Resolution scale". We would just want to look into that value. im running 4k monitor and 1080 P monitor with 175% scale. The Voltage mV is ranging from 450000 to 1243000 tho. Perhaps that's wrong? Thank you for the information! I'm trying to look into this to see if we can get this replicated on our end! Just installed and I"m in the same boat with the tiny dots in the left corner. I have the same problem with X1 0.3.13.1 / and 0.3.4.0 At default speeds with my FTW3 2080 Hybrid and OC switch, it crashes with default settings during a oc scan. I posted the graphic cards section yesterday and didn't think to look here. I also submitted a ticket about it and received one an hour ago stating to uninstall the evga folder in app data and reinstall windows. I already did 2 windows 10 resets and a full install. Pretty disappointing to spend 6/8 hours hours reinstalling everything to find out x1 .0.3.12 is the only latest version to be working. Might just switch to afterburner. For the moment, I think Afterburner is the tool of choice. AB can currently do the locked full time voltage/clock combo that was called "K-Boost" in previous Precision X versions. 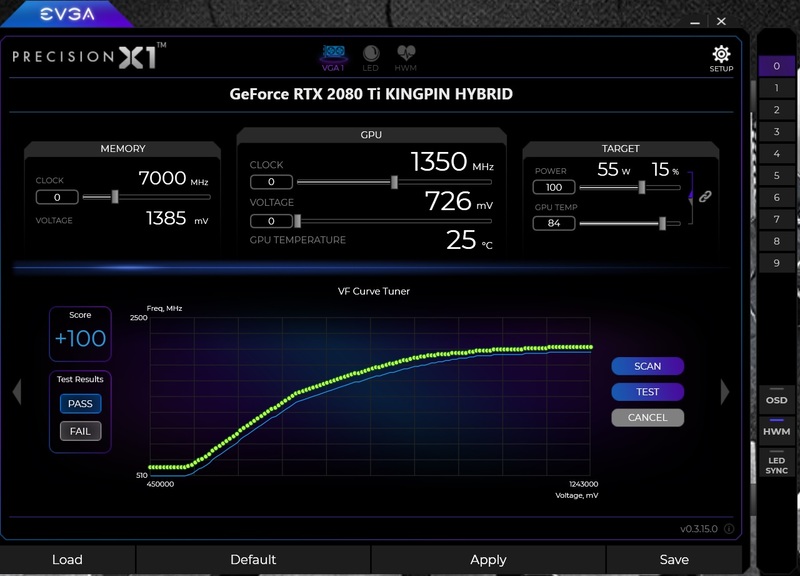 I think that function is needed before Precision X1 will get much love for competitive overclocking. If it's there, perhaps someone can point it out to me. It needs the advertised control of the OLED, too. Hey guys, just an update, but we have located a source for this bug, and have sent this over to our software team to resolve in an upcoming release. Interesting. I'll look into this. another problem i noticed is that the GPU temperature on the top under voltage mV, seems to get stuck, it stops corresponding with GPU1 sensor in the icx window quite often. And the OSD works sometimes. Also it sure would be nice if we could detach the Hardware Monitor to its own window. Hey guys, an update for Precision X1 is now available (https://www.evga.com/precisionx1/). This should fix this issue. If you had this issue, can you please confirm that this is resolved? Issue appears to be resolved on my end. Thanks Jacob ! Thanks Jacob px1 3.15 fixed the vf curve tuner for me too. Great! Glad to hear that everything is all cleared up! :) Thanks for confirming you guys! Thank you very much! :) Always appreciated!